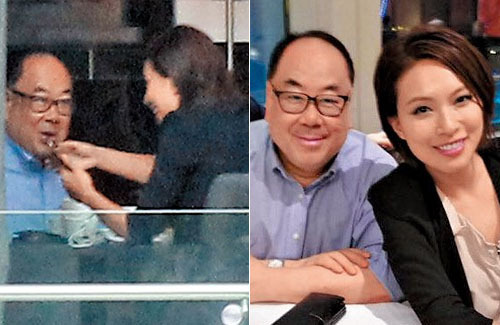 Queenie Chu’s (朱慧敏) love life became a top priority for the paparazzi after the former TVB actress broke up with Eddie Pang (彭懷安) in 2015. The ex-beauty queen, who left TVB in 2016, has been spotted going on several dates. She was first rumored to be dating a “little fresh meat”, which was then followed by the gossip that she was the third person that broke Daisy Ho’s (何超瓊) marriage to Ho Chi-kin (何志堅). Queenie has since denied both claims, clarifying that the former was her younger cousin, and the latter was just a friend. In reality, Queenie probably has no time to date. Although no longer with TVB, the 36-year-old hasn’t gone a day without work. Busy with her own business and managing MC jobs, Queenie has to fly back and forth for her meetings. But her dry spell may be breaking. A while ago, paparazzi spotted the 36-year-old at an opening ceremony with her assistant and a female friend. After enjoying their afternoon tea together, Queenie left the girls to meet up with an older, bespectacled man at a hotel restaurant. Paparazzi discovered that man is actually a college professor, and judging from his interaction with Queenie, they appear to be pretty good friends. Their conversation lasted until dinner. Could this college professor be Queenie’s new love interest? Boy if they’re really dating must be the money reason because he can probably be her uncle already or even father? I didn’t know she left tvb. @cutie777 I was about to say the same thing! What a shame that she left the station (though to be fair it’s not as if they treated or promoted her properly.) I will miss her pretty face and decent acting skills. Wish her best of luck. As to her partner situation…I really hope she’s not dating the guy in the pic. @coralie I know right? Maybe she wants to be the real housewives like the rest. I remember when Gigi Lai married her husband I was really shocked about it. @cutie777 see, i don’t think queenie wants to be a housewife. she’s a business woman in her own right. gigi was looking more for someone to lead her (and maybe help with her expenses and burden). i don’t know what queenie would need a professor for… it’s kinda weird. @cutie777 maybe he is really nice to her and she’s trying to get away from her previous type? As I don’t see her as dating someone for money as her ex wasn’t loaded. @happybi Iike you said her ex boyfriend is not loaded with money so maybe that’s why she’s moving onto next step who knows right? @cutie777 Not sure.. maybe she think it’s better to date someone who is outside the industry..and someone who is totally different.. if he is a nice guy.. not a bad choice. @cutie777 this guy is a college professor. queenie herself is working too. nothing wrong with queenie being with this guy. it’s inner beauty and character one goes for. but queenie’s acting skills are not bad…a pity she left. @cutie777 She got booted off Home Love Home when it was popular because of her diva attitude. So its no surprise if she has to leave coz don’t think she was getting any more work after that. @mike that’s not good then at least she’s a good actress alots better than Grace and Sisley for sure. Isn’t there another diva has the same problem as her with an diva attitude? I believe her name is Whitney Hui? He’s a college professor, not some kind of multimillion company founder. Seeing any gold digging ambition on her side here seems like a stretch. They seem to enjoy each others’ company. Let them be.